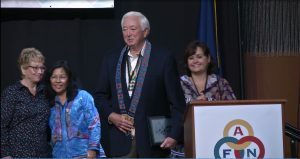 Southcentral Foundation Board Member Roy Huhndorf was honored by the Alaska Federation of Natives with the Dr. Walter Soboleff Warriors of Light award on Oct. 20 during the annual convention. The Warriors of Light award is named for the late doctor who was a Tlingit scholar, respected Elder, and religious leader. The AFN award recognizes an Alaska Native who uplifts and unifies our people. moved to Anchorage after his service, where he became involved in the land claims settlement. Board of Regents, United Way, and other organizations.